Television comes back after its long holiday nap, with the final Stargate Atlantis. We've got clips from the series finale to say goodbye Sheppard, Ronon, and sweet McKay... we'll miss you most of all. To celebrate the final passing of SGA the Sci Fi Channel is running a week long marathon. The Stargate Atlantis marathon takes flight on Monday, beginning with Season 2 from 8 AM until 4 PM on the Sci Fi Channel. Fox FX has a great selection o' scifi tonight. Watch urinary tracts get healed with the mere wave of an inmate's hand in The Green Mile at 4:30 PM, followed with the rather unfortunate The League of Extraordinary Gentlemen at 8 PM. To top it all off, there is an 11 PM showing of Spawn. 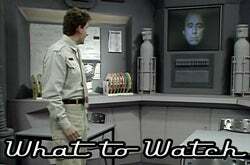 Stargate Atlantis Season 2 and 3 Marathon on the Sci Fi Channel from 8 AM until 6 PM. Find out your chances for getting crushed by a world-ending asteroid here on Earth, in this week's The Universe on The History Channel at 9 PM. Stargate Atlantis Season 3 and 5 Marathon on the Sci Fi Channel from 8 AM until 8 PM. Stargate Atlantis Season 5 is on the Sci Fi Channel from 8 AM until 6 PM. The final episode of Stargate Atlantis "Enemy At The Gate" brings a lot of old faces back to Atlantis to try and stop an invading Wraith Hive from getting into the Milky Way Galaxy and taking over Earth. Team up, SGA and make us proud, this is your last episode ever...until the made for TV movies sometime in the future. "The Gungan General" is a Jar Jar Binks-centric episode, mixed with a little chain gang runaway action. Hey, at least Obi-Wan is as unhappy about being around Jar Jar as I am. The next episode is on 9 PM on the Cartoon Network. This week on the Amanda Tapping-and-monsters show, it's the second part of the "Revelations" two-parter, where Henry and Ashley are held captive by the evil Cabal. Find out if they make it out alive at 9 PM on the Sci Fi Channel. Adam Sandler in a gimmick movie — say what? Click the movie where Christopher Walken hands Sandler a remote control to his LIFE, which of course teaches us all a valuable lesson about something or another. Click is on Fox FX at 5:30 PM. But if that's not heartstringy enough for you. ABC family is showing Practical Magic at 8:30 PM. It's full of midnight all-girl margarita table dancing madness, and witch women Sandra Bullock and Nicole Kidman. I think it's like a rule from the 90s that if you made a movie with a predominantly female cast, you had to have a scene where they all danced around a table. Movies: Let Wesley Snipes show you how it's possible for vampires to walk in the daylight and get hideous hair cuts. Blade II and Blade Trinity is on TNT at 3:30 and 5:30 PM.